For women alone, travelling in a taxi is a useful mode of transport – but it can also be quite nerve-wracking. Statistics support these concerns: in London, an average of 10 female passengers report sexual assaults every month. Here are our vital tips to help you stay safe when you’re taking a taxi. 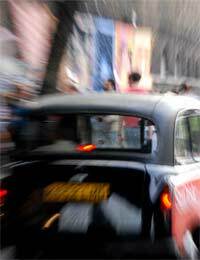 It’s an old banger- Taxi licensees are required to show that their vehicle is mechanically healthy. There’s no taxi meter- Actually, this isn’t as straight-forward as it seems. Some local councils DON’T insist on taxi meters. If there’s no meter, make sure that you agree a price for your journey. There’s no taxi licence on display- Your driver should have a badge on display bearing his or her licence number, issued by the local council as a symbol of safety. The driver doesn’t know the location of your destination- If the driver is asking you for directions, they don’t know the area. Are they a licensed driver? Someone you don’t know has hopped in and suggested sharing the taxi- It’s not unknown for criminals to act in pairs in these situations. The driver has bypassed the front of the queue to pick you up It’s not a lucky coincidence. Don’t get in. Your local council controls taxi licensing, which is different according to the region. They may control the range of colours permitted for taxi and hire cars, for instance – if all the taxis look the same when you’re standing in the queue, that’s a good clue. (This can be a useful way to spot the fakers from a mile off!) Taxis aren’t obliged to have meters, but they are VERY likely to carry radios so they can communicate with their base unit or employer. Your local council may have initiatives to improve the safety of taxi passengers. First, whenever you can, pre-book your taxi, or telephone a local firm when you leave the venue. This ensures that you’re getting a licensed taxi and not getting picked up by a fraudster. Give your last name and ensure the driver knows it when (s)he picks you up. Don’t put your bag into the boot, in case you need to do a quick drop-and-roll. (It can happen.) If you’re on your own, as soon as you get into the taxi, take down the licence number – type it into your mobile phone and text it to a friend. Keep your mobile switched on and close to hand. But don’t spend the journey chatting – keep a close eye on the route your driver is taking. If you do speak to the driver, make sure you don’t give away any personal information about yourself. If, at any moment, you begin to feel uncomfortable, then ask to be put down in a well-lit area and call for another cab. Don’t feel embarrassed to do this – authentic taxi drivers understand their passengers’ worried and will be happy to let you out at a safe place. If the driver won’t stop, call the police or start yelling from the window. At the next traffic lights or crossroads, you should be able to use the door handle to let yourself out.